30c Orange, A. Grill (81). Perforations complete on all four sides, bright shade, bold quartered cork cancel and trace of circular datestamp at left, small (and utterly insignificant) stain at bottom, essentially sound VERY FINE. ONE OF EIGHT RECORDED EXAMPLES OF THE 30-CENT 1867 ALL-OVER GRILL, OF WHICH ONLY SEVEN ARE AVAILABLE TO COLLECTORS. AN OUTSTANDING RARITY OF CLASSIC UNITED STATES PHILATELY. OFFERED TO THE MARKET FOR THE FIRST TIME SINCE OUR 1975 RARITIES SALE. There are eight 30c A Grill stamps recorded in our census, which is shown here and available at our website at http://siegelauctions.com/dynamic/census/81/81.pdf . 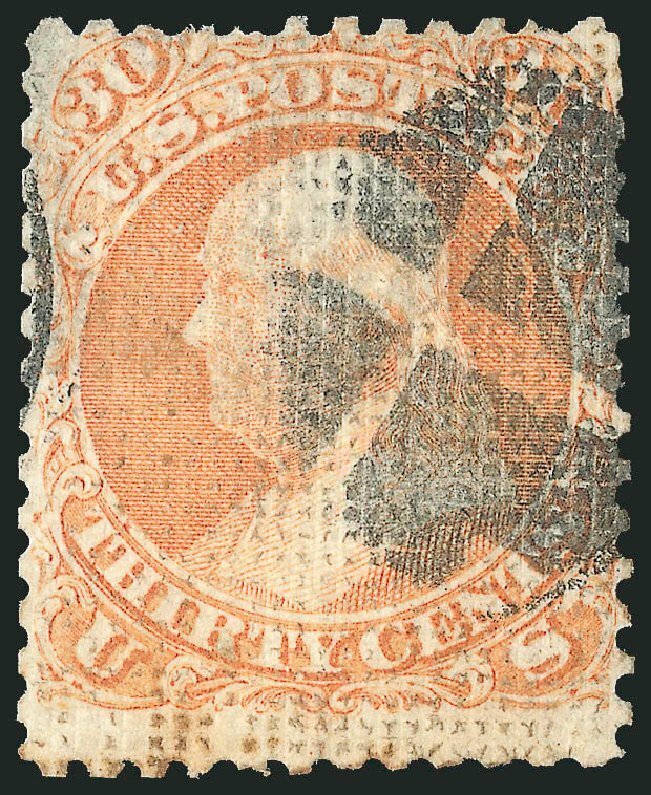 All are centered to upper right and cancelled by a quartered cork (at least two types). One of the eight is the New York Public Library’s copy, which was stolen and recovered, but those responsible for finding a buyer for the stolen stamp added ink to the face to change its appearance. Excluding the NYPL copy, there are seven 30c A Grill stamps available to collectors. Six of the available stamps have missing or pulled perforations and/or margin defects. 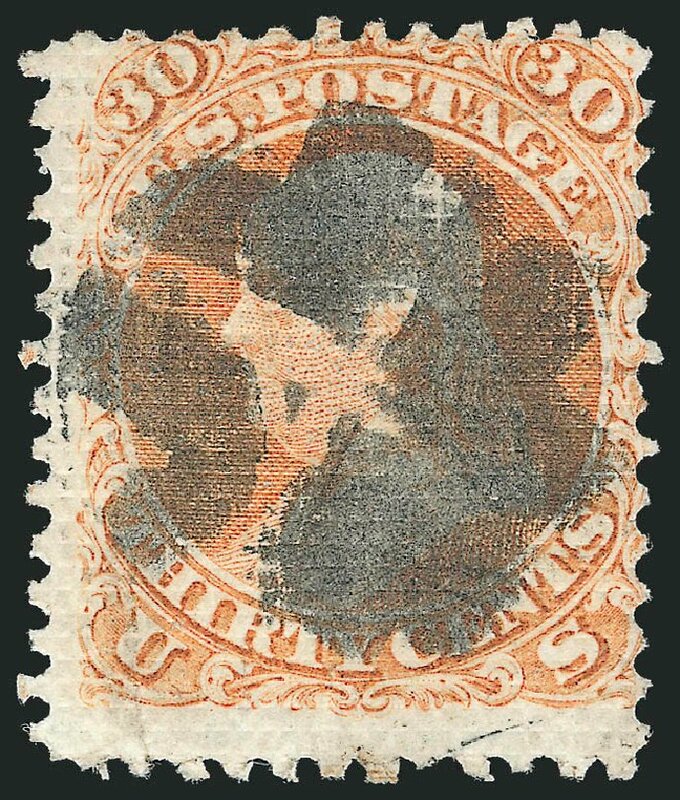 The small stain at bottom of the stamp offered here is very minor and should not be considered a “fault” in the technical sense of the term. This stamp is for all purposes sound and thus of even greater rarity and value. Census No. 80-CAN-02. Ex Schilling and offered to the market for the first time since our 1975 Rarities sale. The only other example to be offered in one of our auctions since at least 1994 is the ex Zoellner/Natalee Grace copy. With 1969 and 2015 P.F. certificates. The footnote in Scott Catalogue notes that “All are more or less faulty and/or off center. Values are for off-center examples with small perforation faults”. 30c Orange, A. Grill (81). Perforations complete on all four sides, centered to top right as are all known examples, dark shade, quartered cork cancel THIS IS THE FINEST OF THE EIGHT RECORDED EXAMPLES OF THE 30-CENT 1867 ALL-OVER GRILL, OF WHICH ONLY SEVEN ARE AVAILABLE TO COLLECTORS. AN OUTSTANDING RARITY OF CLASSIC UNITED STATES PHILATELY. There are eight 30c A Grill stamps recorded in our census, which is shown at left and available at our website at http://siegelauctions.com/dynamic/census/81/81.pdf . All are centered to upper right and cancelled by a quartered cork (at least two types). One of the eight is the New York Public Library’s copy, which was stolen and recovered, but those responsible for finding a buyer for the stolen stamp added ink to the face to change its appearance. Excluding the NYPL copy, there are seven 30c A Grill stamps available to collectors. Six of the available stamps have missing or pulled perforations and/or margin defects. The copy offered here is remarkably sound with full perforations on all sides. Census No. 80-CAN-07. Ex Engel, Sheriff and Zoellner. This is the first we have offered since the 1998 Zoellner sale. With 1959 Colson certificate, 1959 and 1998 P.F. certificates. The footnote in Scott Catalogue notes that “values are for off-center examples with small perforation faults”.